When my son wanted to make a visit to Blastcamp to go paint balling with his buddy, I contemplated whether or not to make the trek back home or to wait it out in the area until he was done. After dropping him off, I decided I'd stop for brunch and then check in to see if they were tired out and ready to head home. 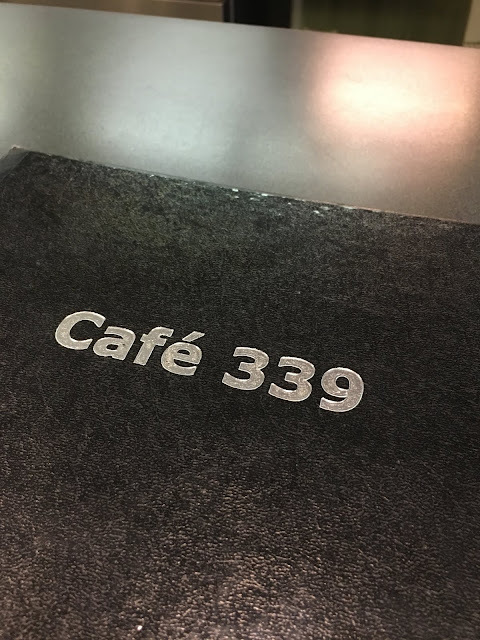 I drove into downtown Hobart and came across Cafe 339. There was quite a crowd on this late Sunday morning and I wasn't sure what to expect. It was a nice surprise coming across this diner/cafe hybrid. It's got the makings of a small-town classic diner - with hearty breakfast dishes, sandwiches and more and with counter seating. However, it takes it up a few notches from the diner environment. The decor is modern and clean. The menu includes some classics with an upscale twist. They serve alcohol, too...so you can have a bloody Mary or mimosa with your Sunday brunch. 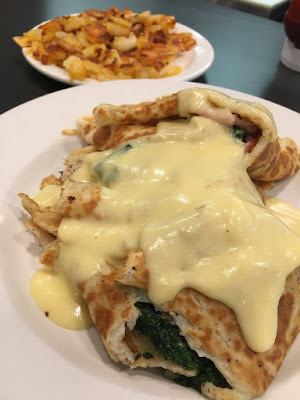 It was all the things I love about a main street breakfast spot and more. 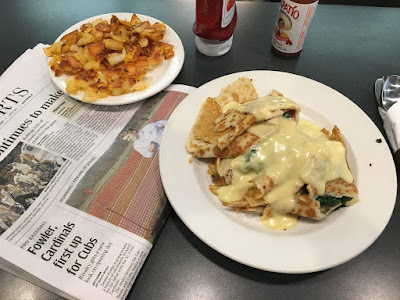 I enjoyed the Zamboni Crepes (I'm a sucker for anything covered in Hollandaise sauce) with a side of nicely-browned, crunchy potatoes. I'm not one to dine alone very often, but I had a nice relaxing morning chilling on my own while my son had fun at the paintball field. I perused the paper and chatted with the gentleman next to me about the Cubs. I even took a walk across the street afterwards to visit the Librium Cafe, which I had read about previously. Downton Hobart has a nice little main street and if you ever find yourself out that direction, be sure to stop in for a nice helping of Hobart hospitality and some really good food.